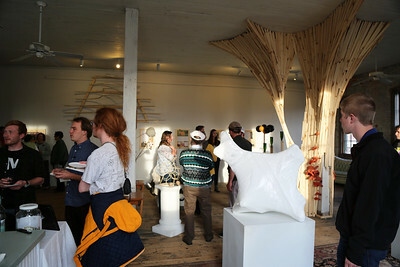 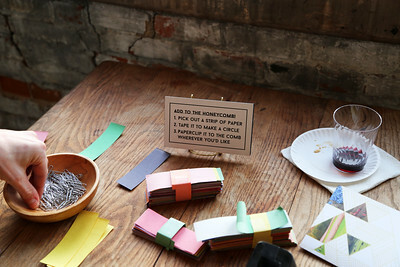 The "Zoethica" opening reception took place on Friday, April 7 from 6-9pm. 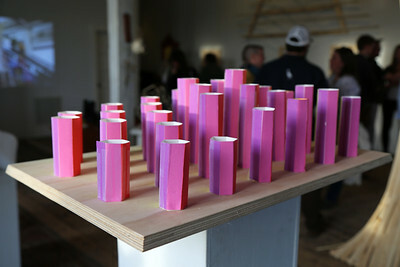 The audience got a preview of the artwork produced by Peter Krsko and visiting artists Katie Schofield and Dan Steinhilber along with their students during a semester-long residency at UW-Madison. 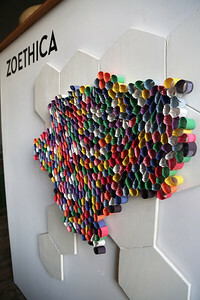 The students from the course "Zoethica: Bioinspired Art and Science" presented their personal projects. 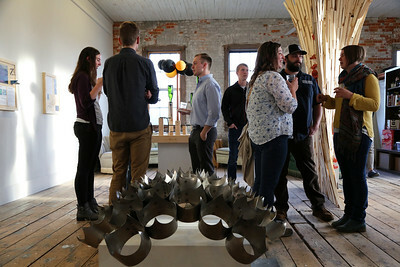 The exhibition is on view from April 6 - April 29, 2017 at Wormfarm Institute's Woolen Mill Gallery, 28 E Main Street, 2nd Floor. 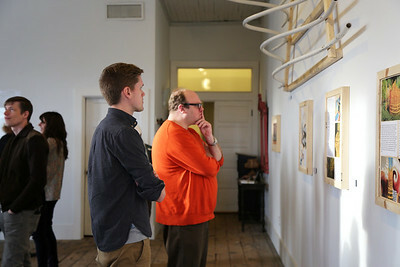 Zoethica student Evan Eifler (foreground) looks at another student’s work in the exhibition. 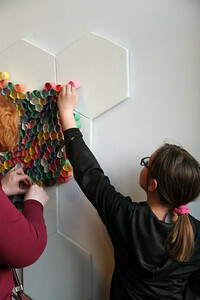 Attendees are encouraged to participate and add to the ever-growing honeycomb art (started at Peter Krsko’s Wisconsin Science Festival talk in October, 2016). 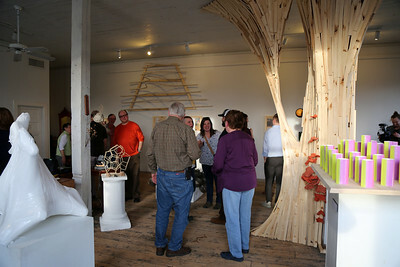 View of the exhibition at the Woolen Mill Gallery (Reedsburg, Wisconsin). 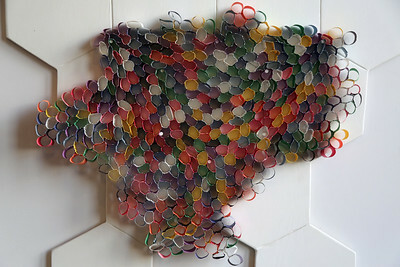 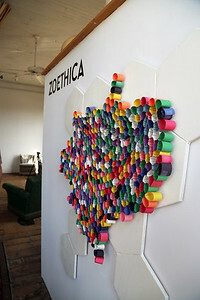 The honeycomb work of art hangs below the "Zoethica" title sign. 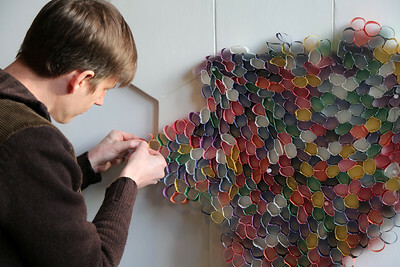 Guest Jeremiah Lewis adds to Peter Krsko’s honeycomb artwork. 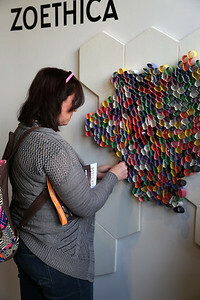 Guests add to the ever-growing honeycomb work by Peter Krsko. 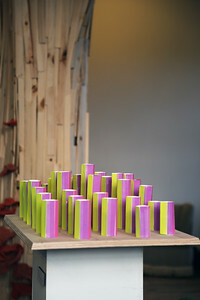 “Iridescence,” a small-scale model that depicts how iridescent color changes work in nature (for example a peacock feather). 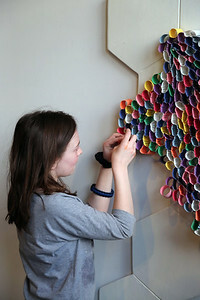 The final work will be on display at Olbrich Bontanical Gardens May 5-August 6, 2017. 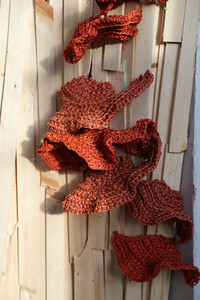 Katie Schofield’s crocheted work on Peter Krsko’s installation at Woolen Mill Gallery. 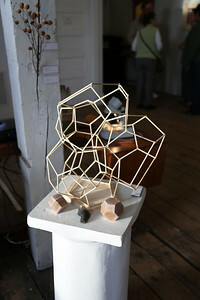 This small-scale sculpture is connected to Peter Krsko’s “Inner Foam” currently on view at the Discovery Building and will be part of the "Zoethica" exhibition at Olbrich Botanical Gardens. 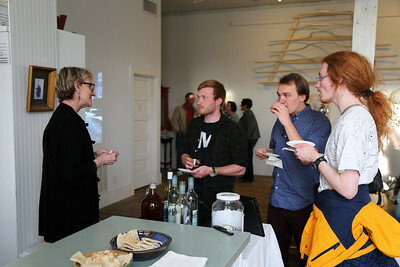 Donna Neuwirth (Wormfarm Institute) talks to Peter Krsko’s UW-Madison students: (left to right) Christopher Jossart, Patrick Noel and Joel Cryer. 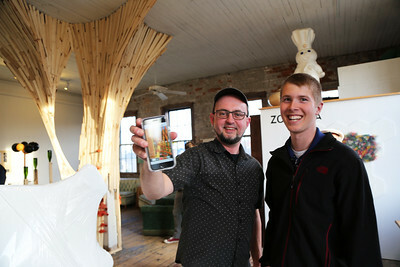 Peter Krsko shows off a virtual 360-construction student Leo Joseph Steiner created of his soon to be built work at Olbrich Botanical Gardens. 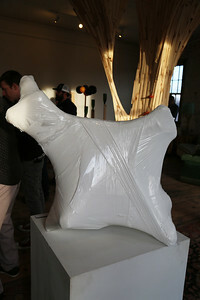 This stretch-wrap work was created by guest artist Dan Steinhilber during his time in Madison. 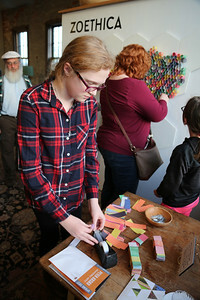 Students in the course created similar works that will be on display, along with a large piece by Steinhilber, at Olbrich Botanical Gardens. 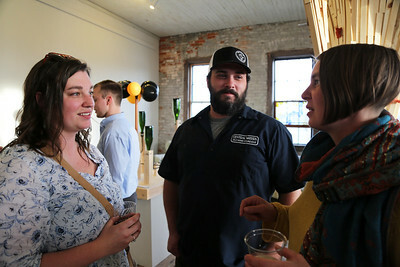 Guests talk to Laura Mortimore at the opening. 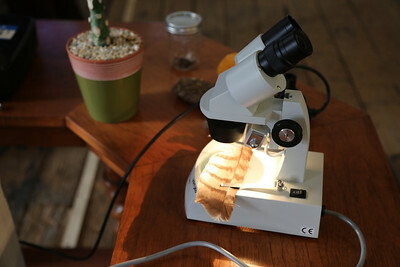 For students in Zoethica: Bioinspirted Art and Science, inspiration from nature started with examining forms through microscopes (as seen here). 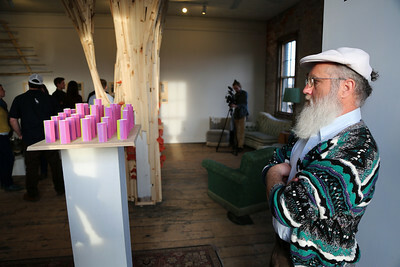 View of the exhibition at the Woolen Mill Gallery (Reedsburg, Wisconsin) with Peter Krsko’s “Wild Bergamot” in the foreground.